Crude prices have retreated 35% from their peak over the past 7 weeks, fueled by an unexpected walk-back on Iranian sanctions from the US, as well as continued signs of drastic overproduction across the largest Crude producers, including the US, Russia, and Saudi Arabia. The black gold is now set to begin a recovery in prices as investors find renewed confidence that OPEC is expected to begin cutting down their production levels after their meeting in early December. 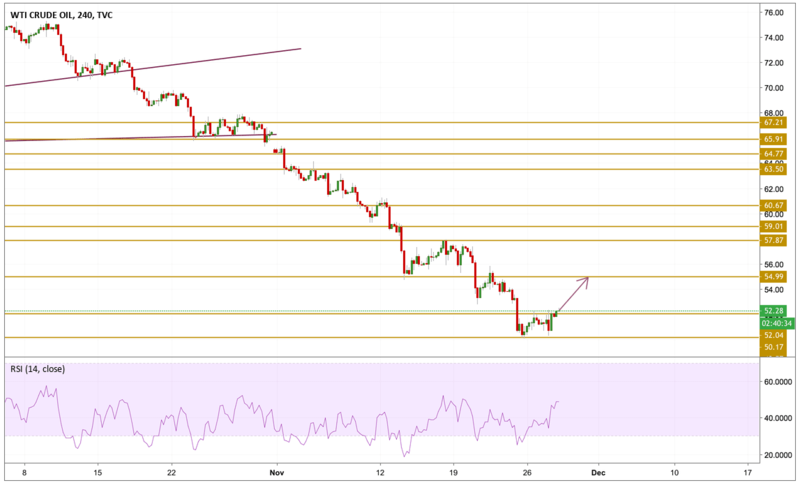 As expected, Crude prices tested the lows near the $52 level and failed to break to the downside, so a moderate recovery begun breaking above the $52.28 resistance level after developing some bullish momentum as we can see on the chart. We expect the recovery to continue with our focus on the $54.99 level.